Harrison Ford was seen wearing this apparel as Han Solo in Star Wars: The Force Awakens movie. 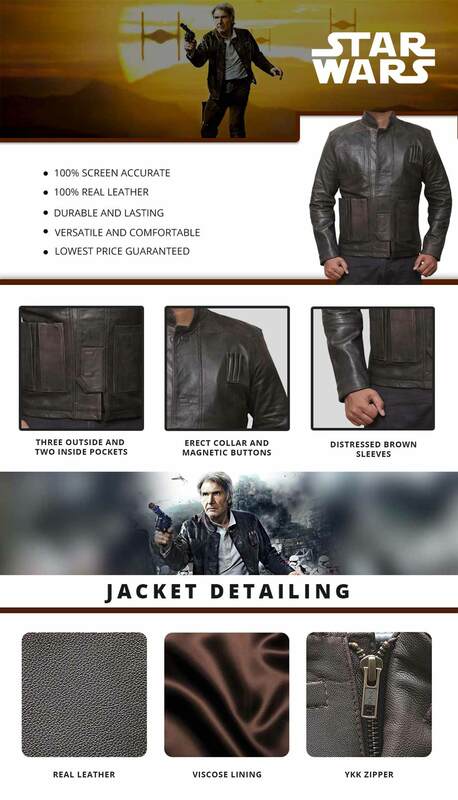 If you're looking for the same outfit, then you must grab yourself this Star Wars Han Solo Leather Jacket. That's right, now is your chance to catch the same view as observed in the movie. 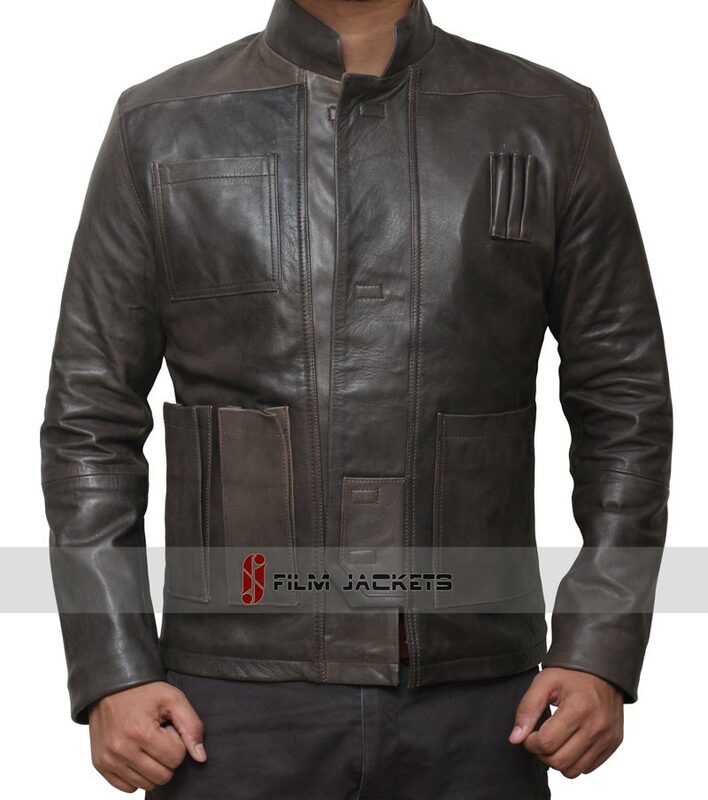 This Han Solo Jacket Force Awakens is made from real leather, with viscose stitched inside for your comfort when you wear it. It is the straight fitting, screen accurate apparel that can be worn in a casual style, just like what Harrison Ford did in the movie. “Han Solo – A loner who realizes the importance of being in a group and working for the common good”. This how the creator of Star Wars George Lucas described him. If you have seen the movie, you will realize how true it is. We saw Han Solo coming from nothing and becoming one of the most important and iconic characters of the original trilogy. The Han Solo costume guide here focuses on the two outfits that Harrison Ford made famous by his ruthless yet flawless acting. If you haven’t tried this outfit yet then this your chance to impress some Star Wars geeks by cosplaying Han Solo to ultimate perfection. I shall add if you follow our guidelines not only your lifelong Princess Leia but also your supposed daughter Ray will be all over you. So click now and see how can mimic this prolific star. To capture the Star Wars style, we have brought you a similar inspired Jacket straight out of the movie. Impressive logistic. It is designed right as described on the website and has three inside pockets (two usual ones and a smaller one for smartphones). The size fits according to the size-table. The quality is o.k. in proportion to the price, this jacket is good for spring or autumn seasons in my view (lets say 15-20 °C or 60-70 °F). I take off one star because of the chemical treatment to make the leather look stressed or vintage. Anyway I like to wear the jacket and its special design. The product itself is absolutely amazing!! Very comfortable, very true to the movie. A fellow die hard Star Wars fan knew right away it was Han Solo’s jacket... very accurately done. I did have issues with shipping though. That was very frustrating. Took way longer than it should have. But this is a product review, so as far as the product.... no complaints, great product!! I love it!!! Well done guys!! I’ve had my jacket for over a year and felt the reviews needed a a female voice, so sorry I’ve been somewhat remiss until now. Ladies, this is a great jacket! The leather, seams and finish is of a high quality. Even at an XL (I’m under 5’ 1” and large enough), the fit is excellent. Although the external pockets can be a bit useless (costume designers, huh?! ), there’s a couple of good inside ones - huzzah!!! All-in-all this is a more than decent jacket for an unexpectedly reasonable price. Ladies, I’ve been more than pleased with my purchase. I must say, I am very pleased with this jacket. It arrived quickly and well packaged. The quality is exceptional for the price, and the jacket is as close to screen accurate as you can get without shelling out a small fortune. The jacket is fully lined and absolutely perfect for daily wear. 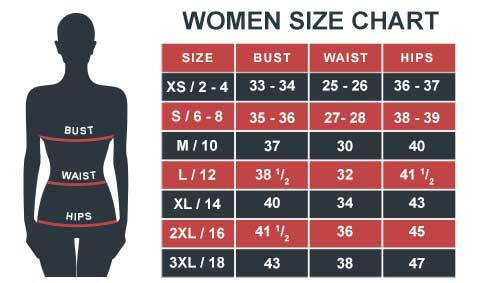 Sizing is spot on, so go with a size up if you want to wear it with a sweater or thicker clothing underneath. Great job, FJackets! Nothing can compare to the quality that Fjackets makes. I can say it is an excellent Han Solo Jacket with a similar structure of original one. Bought this for a good friend for Christmas (along with the white shirt). He said it fits nicely (sleeves a bit long). Very soft and very nice. Came in a nice holiday bag and shipped very fast. excellent jacket for a great price! after a lot of sizing deliberation my wife got me this jacket for my birthday. i'm 5'6", 175 lbs with a wide chest, short arms & a thick neck. i wanted to be sure i could wear a thick flannel under this so i went with the large. it fits great with or without a layer underneath. the arms are a lil long (it's a standard cut) but i'm used to that happening with my short arms. i'm a bit clumsy and unlucky with my favorite garments so i reached out to f jackets in email and on Facebook to see if they recommend a leather protector but i didn't get a straight answer. so i did some research and took a chance on Chamberlain's Leather Milk No. 3 (from amazon, get it with the applicator pad). i am extremely pleased with how it turned out, it darkened the leather just a hair. i like it even more now, don't have to worry about ruining my favorite jacket and it looks more authentic. i highly recommend this jacket to anyone looking for a functional but subtle star wars garment they can wear every day. it's amazing quality at an extremely fair price!! Got my jacket today! Tried it on and it fit great! Sleeves are a bit long. But I can fix that. The craftsmanship is amazing for a cosplay jacket under 200 dollars. I put my Jedi academy logo pin on the lapel Lol! The lining is perfect for cool fall or spring days. I don't think its made for hard winters. You'd have to wear something under it. I plan on wearing this to the next star wars premiere. WELL DONE GUYS!! The shirt and jacket arrived. I wanted to say the jacket is amazing! Not only does it look just like Han Solo's jacket, it is also just a good jacket all around. It's a great jacket. If you want to wear anything under it like a sweater get a size bigger. I'm 6'2" at 180 and a tshirt fits fine under a size large . It's a really nice jacket and fits completely well. Thank you. My wife got me this for my birthday, needless to say it I wasn't disappointed. It fits great, looks sharp, and is sew together awesomely. My wife went to art school for fashion design and immediately noticed and was impressed with the high quality stitching. Overall a great product. Side note for sizing, I'm 5'6" and 165 pounds, the small fits great for a fitted jacket, if you want to wear thick clothing under the jacket go up a size. Great looking and fitting jacket! Jacket fits exactly as stated in the sizing chart. I've gotten tons of compliments! Exactly as Pictured! Love the Jacket!! I've been intending to leave a review and after a month, here it is! After looking through many websites for the "perfect" affordable Han Solo Force Awakens jacket, FJackets.com was definitely the right choice. While there are a few minor things that don't make it movie accurate, it's close enough and I didn't have to pay $800 for it. It's real leather and the closures are magnets (not velcro). It shipped super fast and I received it within a week of ordering it. Best Birthday Present Ever!!! Thanks FJackets! I've already got my eye on that Finn jacket. Though having a little problem on the size change applications, the quality of the jacket is really nice. Like it very much! I looked at a number of jackets online for this character and since I run a number of costumes at any given time, I just don't see spending $800 or more a piece. I was hoping this jacket, at $175 would fit the bill and I wasn't disappointed. The Film Jackets piece had five reviews on their site, all pretty good. I had heard this jacket originally had velcro snaps but they changed the design and went to magnet closures, just like the film version. Works great. They're pretty strong (maybe 5 lb?) magnets but for the costume, you'll wear this open anyway. The jacket is leather and clearly smells and feels like it. It's thinner leather so maybe it's lamb. Hard to tell. The jacket is NOT distressed and I don't think I want to try since I don't know what kind of leather it is. But it looks fine to me. It's a light jacket which is great since I mostly cosplay at southern shows. I don't want to be baking in a hot leather jacket. The construction is very good. The seams are tight and the stitching is consistent. The lining inside is better than I expected and there are pockets. As for the outside pockets and tool sleeves, they all look to be in the right place and lined up appropriately. The two long pockets on the lower bottom right are indeed pockets. For sizing, my numbers were right between XL and XXL. I have ordered stuff from China before (not sure if this company is in China or not) and you usually have to buy 2 times larger. However, I took a shot and went with the XL. It mostly fits me, surprisingly, meaning their sizing is dead on. My only complaint is that they don't ask for sleeve measurements. My sleeves are a little long. It's fixable but if you order from them, you should include your measurement from shoulder to wrist in the comments box. Maybe they will custom that for you. I did talk to their customer service about a payment issue I had (my fault, not theirs) and they were super nice. All in all, I'm very happy with it. $175 isn't a bad price and it shipped really fast. I don't feel like I was cheated at all. We'll see how it holds up to a couple of cons but I'm not too worried about it. Nicely done, guys! This jacket is the real deal! Just like in the movie, top quality and a great price. Fit is just right. Lots of compliments from those who do and don't know Star Wars. I'll be looking for another soon! Being my 1st purchase from this site I wasn't sure what to expect. The delivery time was estimated as Dec31st. It arrived today Dec24! Basically 2 days after my purchase, on XmasEve (surprised!). I was prepared for it to be synthetic fabric, but upon opening it gave the smell of "real" leather. Part of a pocket is unlined and I can see that it is in fact real, not fake leather. It closes with Velcro rather than magnets: that is disappointing, but I think I may be as to alter it. It also has a zipper for front under flap. Not accurate with it, but good for a jacket quality. The front right pocket seems a bit large as it is sewn with a expanding nature. The color is distressed and appealing with age. I ordered a large, (for a 44" chest) and it fits well. Not a trim/personal fit of my torso, but a good average size fit w good length sleeves. Over all I'm very pleased. For me, this jacket is better when you wear it without closing the front. It has the whole bold look to provide you of the character. It you prefer wearing it for the opening then you gotta stay true to the look. I wore it with a off white shirt, brown khaki pants and the movie’s replica belt from Amazon and made it a DIY costume. It worked out great. When I decided to close the jacket, I didn’t feel anything special. True fans like me will make the best of what you wear. It doesn’t have a zip to close so it’s not necessary to close it when you wear it as a costume. For those who want to treat it as a normal jacket then it’s okay, but I think it’s better to keep it opened. As for the jacket, there was no problem in the delivery as it arrived just on time. The length is alright and is really comfortable and strong. I hope you’ll make more jackets like this. I was waiting for this jacket ever since you’ll made this collection. Finn’s jacket looks okay but the real class is in Han Solo’s. I wore this at the Comic Con event in Florida at Panama Beach. It was a very big crowd this time. I wore it with the complete set. I just didn’t have the bullets which are in his left pocket. I instead had a pen for autographs. I also wore it on a couple of days for a casual look. I really adore the realistic distress look. So it is appropriate to wear it as a costume and as a fashion outerwear.